With an elevated pier foundation, this stunning home is perfect for waterfront properties. Magnificent porches, a balcony, and a plethora of picture windows take advantage of beach or lakeside views. The dining room, kitchen, and great room are open to one another for an airy spaciousness, and each accesses the wrapping rear porch. The great room features a ten foot high beamed ceiling, a fireplace, and a space saving built-in entertainment center. The staircase is highlighted by a grand window with arched top, while a palladian window accents the upstairs loft/study. 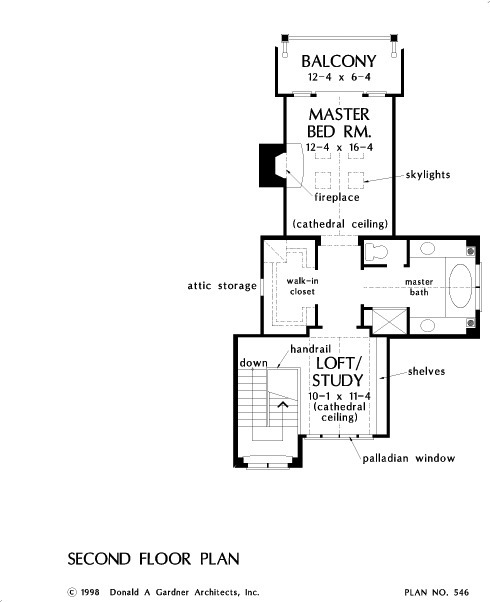 The master suite is the essence of luxury with skylights, a fireplace, cathedral ceiling, balcony, a spacious, vaulted bath, and an oversized walk-in closet. 1st Floor: 1366 Sq. 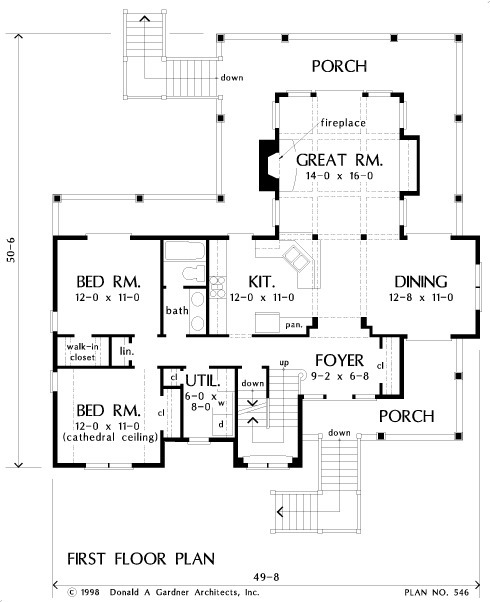 Ft.
House Dimensions: 49' 8" x 50' 6"
Great Room: 14' 0" x 16' 0"
Master Bedroom: 12' 4" x 16' 4"
Kitchen : 12' 0" x 11' 0" x 10' 0"
Utility Room : 6' 0" x 8' 0" x 10' 0"
Garage : 20' 2" x 22' 2" x 0' 0"
Garage Storage : 12' 4" x 15' 6" x 0' 0"
Master Bedroom (Cathedral): 12' 4" x 16' 4" x 14' 0"
Bedroom #2 : 12' 0" x 11' 0" x 10' 0"
Bedroom #3 (Cathedral): 12' 0" x 11' 0" x 13' 0"
Porch - Front : 18' 8" x 4' 10" x 0' 0"
Porch - Rear : 28' 8" x 6' 10" x 0' 0"
Porch - Left : 6' 10" x 11' 10" x 0' 0"
Porch - Right : 6' 10" x 16' 8" x 0' 0"
Loft / Study (Cathedral): 10' 1" x 11' 4" x 11' 0"
Balcony : 12' 4" x 6' 4" x 0' 0"
Other : 8' 10" x 3' 8" x 8' 0"
Foyer : 9' 2" x 6' 8" x 10' 0"
Dining Room : 12' 8" x 11' 0" x 10' 0"
Great Room : 14' 0" x 16' 0" x 10' 0"